This map was inspired by an Atlas created by an unknown artist in 1630. The original is on Parchment, 270 x 380 mm and is in the Biblioteque Nationale, Paris. 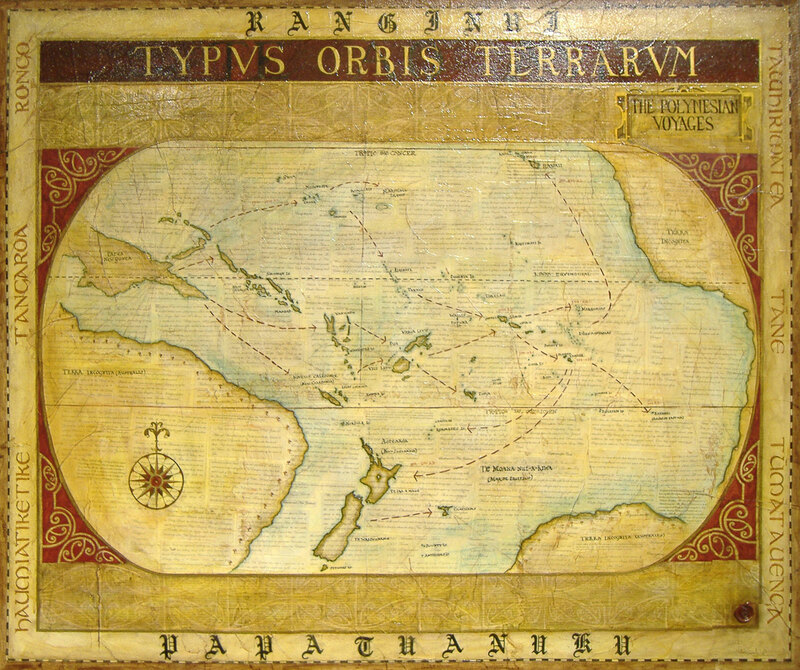 What I have done is to change the image; to the world of the Polynesians as opposed to the Europeans and thus the unknown lands (Terra Incognita) become the land masses that the Polynesians didn’t know about. The size of the Polynesian Islands have all been exaggerated; however I have tried to keep them in approximately the correct direction in relation to each other. The red arrows and dates indicate the movements of the Polynesians. The names of the different Islands are mixed between their original Polynesian & their European names.